I always like to see winemakers try something new. Wine is centuries old, but innovative winemakers can still add a new twist to old methods. Over the past few years I have noticed several winemakers aging their wine in used bourbon barrels. At first I thought it was a novelty and wouldn’t last long. But the practice seems to be more widespread lately. There is a good reason for that. The bourbon barrels impart a distinctive, pleasant taste to the wine. The wine doesn’t really have a bourbon flavor, but you do get some vanilla, caramel and spice that I think comes from the barrel staves. 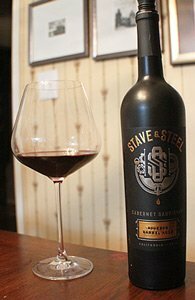 Stave & Steel Cabernet Sauvignon 2016, California ($19-21, and often cheaper on sale), is a pleasant wine to sip before, during or after a meal. It is not overly complex, and it doesn’t aim for any snob appeal. It is just a wine that’s good to drink. It is a handsome dark red in the glass, with light aromas of cherries, nuts and leather. The first sip reveals bold flavors of black cherries, blackberry and plum. The tannins are noticeable, but the bourbon barrels smooth out a lot of the rough edges. The aftertaste is pleasant but not lingering. This is a full-bodied wine, but not one that overpowers you. While it is a good sip by itself, it also works well with food. Stave & Steel doesn’t own any vineyards, so they are free to source grapes wherever they can find them. A previous vintage mentioned Paso Robles, so I suspect that year they got a lot of fruit from that region. This vintage is labeled “California,” so the grapes could be from anywhere in the state. Wherever the grapes came from they produced a very nice wine. After fermentation the wine spent four months in American oak barrels that had been toasted, charred and previously used to age Kentucky bourbon. The rugged label and the story on the back label are clearly aimed at young men. The packaging projects a bold, daring image suited for a modern age. The label might attract some new wine drinkers, but the wine inside will keep them coming back for more. It really is a fun wine to drink. Winery: Stave & Steel is part of The Wine Group, one of the largest producers of wine in the world. They have a large stable of non-snob wine, including Cupcake, Benziger, Concannon, Franzia, Save Me San Francisco and Big House, among others. 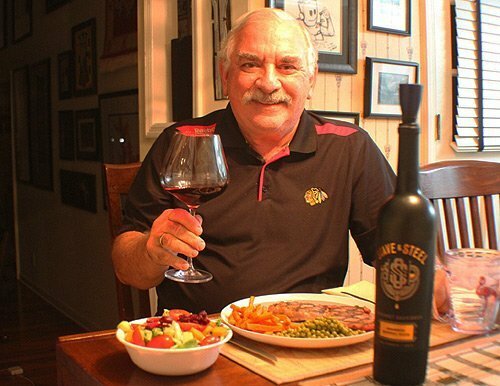 The Wine Group has been around since 1981, but Stave & Steel is one of their newer wineries. Winemaker James Foster said he spent two years of hard work and experimentation before he was ready to introduce Stave & Steel. He said he likes to push the envelope and look for new things, so who knows what he will come up with next. The label brands itself as bold and unconventional, always pushing forward. Based in Livermore, California, The Wine Group also is home to Fish Eye, flipflop, Octavin Home Wine Bar, Chloe, Almaden, Corbett Canyon, Foxhorn, Imagery, Glen Ellen and Mogen David. The company was formed in 1981 by a management group that bought several of the wineries from Coca-Cola when it got out of the wine business. The company has continued to grow by adding brands and by increasing sales. They seem to have figured out how to attract young millenials who are discovering wine. Goes with: We had this with boneless pork chops, sweet potato fries and peas, a simple, yet satisfying meal. I actually use a whole pork loin sliced for my boneless pork chops. It’s easy to find pork loins on sale throughout the year. When I find a sale I buy two or three and freeze the ones I don’t use immediately. When you buy the whole pork loin you can slice it as thick or thin as you like. I usually do about half an inch thick or so, but if you like your pork chops really thick you can do that. The cooking part is easy. Just don’t overcook them. I fire up my charcoal grill and cook the chops for 3-4 minutes per side and then flip them over for another 3-4 minutes or until all the pink is gone when you slice into the chop. I cooked these at church on my large grill/trailer. That always gives me nice grill marks on the meat. I brought a few home and had them a few days later with frozen sweet potato fries. Talk about an easy meal. To make the chops I simply sprinkle Morton Nature’s Seasons on both side before I grill them. I usually serve them with Mumbo barbecue sauce or sauce from Twelve Bones in Asheville. The sauces liven up the flavor, and you could use your favorite sauce, whether barbecue or something else. The meat was heavenly with the bold wine, as the rich, fruity cab brought out the best flavors in the pork chops. We didn’t finish the wine with dinner, so I sipped the rest after dinner. It was just as nice without food. This is a versatile wine. This wine also would pair well with Cajun jambalaya, pork ribs, a grilled steak or even a cinnamon chocolate torte. It will taste best when served slightly below room temperature. If you don’t have a wine cooler, put it in the refrigerator for 10 minutes before serving.